So here is what I've been up too. I've actually...shock...horror...have been assembly lining! I've never done that before, I must admit I'm usually a one time project maker. With all the Secret pals and just plain friends I have, I thought I would make a few of these up. I'm going to embellish the heck out of them once they are sewn up. I got the pattern from a wonderful felter Betz White. 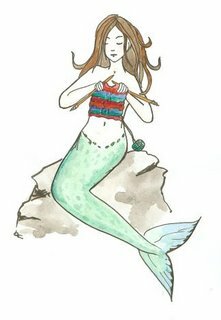 One of these days I'm going to try my hand at making my own pattern. 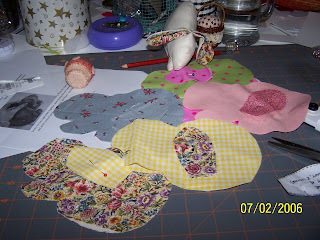 At the moment, it is easier to have a pattern and then embellish it with my own ideas. Some of this fabric is new, some I've had, and some was given to me. Well you're really in the Easter mood...and well great job as well...and for some more resources and fun for Easter just hop over to my blog on Easter Celebrations sometime and enjoy all that i'e posted there!!! My goodness, aren't those cute!! 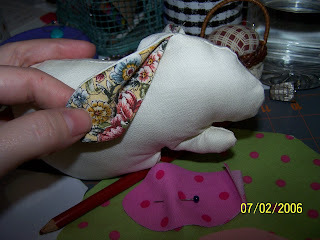 I like the bunny, the ear fabric makes a great contrast. I love the bunny. So cute. It is tempting me to put my needles down and clear the dust off my sewing machine! It never occurred to me to do Easter-specific projects. What a brilliant idea! I'll have to keep that in mind for next year. Oh my gosh, these are *so* cute! The fabric is so beautiful too, really perfect for spring and Easter and everything... great! I look forward to seeing the finished project on here. Hopefully once I have had my textile classes I may start doing some sewing again.